When it came to choosing baby products for my boys, I was pretty picky about what I put on their skin. My family has a history of eczema and allergies, so I didn’t want to risk any potential irritation. That being said, I do love products that have a light, sweet scent. It made finding the perfect baby shampoo and lotion tricky at times, to say the least! I am a little bit of a nut about LUSH Fresh Handmade Cosmetics products. LUSH Bath Bombs are my ultimate favourite indulgence and the fact that these skin-soothing, scent-infusing bath time treats are handmade with fabulous essential oils just makes me love them even more. LUSH also carries an extensive line of cosmetics, body care products and hair care products all made with fresh, ethically sourced ingredients and recently the company announced the debut of its new line of Gorilla Perfumes. I love trying brand-new beauty products but I really don’t have the budget to be able to buy every new cosmetic, perfume and body care product that comes out, as much as I would like to! That’s why the concept of the Luxe Box from Loose Button was so intriguing to me. The company launched in early 2011 and became a hit almost instantly by offering consumers a monthly subscription that delivered a box of the latest deluxe beauty samples to their door each and every month. I got the chance to review a March Edition Luxe Box and I was so excited to see what all the fuss was about. The first thing I noticed when the box arrived was how absolutely stunning the presentation was. The sleek black box was so much fun to open and I was delighted to see the contents nestled in pretty tissue paper and the personalized card and seal that had been placed inside. There was even a unique seed card that could be planted to grow flowers! The box contained J. R. Watkins Lavender Hand and Body Lotion, Cargo Glitter Top Coat, a Cargo Eye Shadow Single and three sample vials of perfume. I was excited to see that CK one Shock for Her was one of the samples; I used to be a huge fan of CK perfumes but I haven’t used one in ages. I unpacked my samples and headed to the bathroom to try them out. The product I was most excited about was the Cargo Glitter Top Coat; I love glitz and glam so having a sparkling topcoat eyeliner for special occasions was thrilling. I wore the eyeliner to the Saskatchewan Publisher’s Guild spring reception and I loved the extra sparkle it added to my eyes. The waterproof formula was a little sticky when I first applied it but once it had dried it lasted all night and helped keep my eye makeup looking perfect. The Cargo Eye Shadow Single was actually a double; it had two complementing colours in one sleek metal compact. It didn’t look nearly as fun as the glitter top coat initially but once I had tried it, I fell in love with the subtle colours. They were perfect for everyday use and the brown shade was the ideal colour for lining my lower lashes when I was creating a smoky eye look. The J. R. Watkins Lavender Hand and Body Lotion was a favourite almost at once. I adore the scent of lavender and Watkins products are so effective and gentle. The natural oils in the organic formula left my hands so nice and soft. But what I was most excited to experiment with was the three different perfumes that I had received. I tried out the Vera Wang Lovestruck perfume first. It was a rich floral scent that had a touch of appealing sweetness to it. I loved wearing it on the days when my husband and I had something romantic planned. The CK one Shock for Her was a much more playful and exciting scent. The blend of passion flower, blackberry and vanilla was fruity, fun and great for wearing every day. But the scent that I loved most was the one I tried last, the Mark Jacobs Oh, Lola! perfume. It was a stunning combination of pear, raspberry and magnolia blended with sandalwood and while it was a flirty and youthful fragrance I also found it to be very opulent. It was a perfume I could really see making my signature scent. I had so much fun with my Loose Button Luxe Box. It was a great way to test out new products without spending a fortune buying full-sized items and it really gave me an idea about which perfumes and beauty products I might want to buy again. The Cargo Glitter Top Coat will be in my cosmetic bag permanently from now on and I’ll likely be getting a bottle of Mark Jacobs Oh, Lola! when my sample bottle is empty! The Loose Button Luxe Box program is so popular that subscriptions are currently sold out, but don’t despair! You can sign up to be put on the waiting list and you’ll receive a notification email as soon as a spot opens up! With a cost of only $12 per month, treating yourself to a Luxe Box subscription is a great affordable way to enjoy some much-deserved luxury every single month. Visit Loose Button to learn more about the program and add yourself to the waiting list; when you get that first gorgeous personalized box full of fun beauty products, you’ll be glad you did! I love perfume, but I am very picky about the scents I wear. I don’t like fragrances that are too heavily floral, and while I used to adore fresh citrus scents, I find them to be somewhat too juvenile to suit me now. I have a few scented products that I like to wear in the summer and one or two that are appropriate for the holiday season. But for the longest time, I have yearned for a signature scent that I can wear every day and that fits my personality like a glove. The fresh, light scent of Prada Infusion d’Iris Eau de Toilette seemed like it might just fit the bill, and I was lucky enough to be given the chance to test it out for myself when Prada launched this lighter and more floral version of the original Infusion d’Iris this fall. The Eau de Toilette comes in a gorgeous frosted glass bottle that exemplifies the classic elegance that Prada is known for. 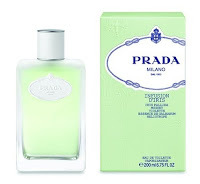 The pale green eau de toilette shows through the bottle beautifully, and the bright white stopper and distinctive Prada crest on the front of the bottle contrast wonderfully with the soft green. The overall effect is sleek and fresh, and I couldn’t wait to see if the scent was as beautiful as the bottle. I sprayed the eau de toilette on my wrists and neck the next morning before I left the house, and immediately noticed how deliciously fresh and clean the fragrance was. The combination of Iris, Neroli, Lily of the Valley, Violet, Heliotrope and Cedar blends together beautifully to create a light floral scent that is reminiscent of a bright spring morning. After putting on the scent, I instantly felt more sophisticated and energized, and I headed out the door with a little extra spring in my step. When one of my friends told me how much she loved my perfume and asked me what I was wearing, I knew that I had found my signature scent. From that day on, I have made sure that I never leave the house without first spritzing on this light yet lavish scent that is both clean enough for every day wear, yet sophisticated enough for the fanciest black-tie event. I love the way that the florals blend together so beautifully to create the distinctively feminine blend and the way that the Neroli and Galbanum balance the aroma with their freshness. I did find that the scent faded away before the end of the day, but it easily lasted until the middle of the afternoon, which is usually the latest I am out and about anyways. For the times when I wanted to make sure that the fragrance had the best lasting power possible, I just made sure that I moisturized my skin well before putting on my perfume. The extra moisture increased the lasting power nicely so that I could still detect a hint of fragrance even into the late evening. Prada Infusion d’Iris Eau de Toilette is the hottest new offering in the Prada fragrance line, which has been providing women with sophisticated scents of unsurpassed quality since 2004. This addictive new scent is available in a 50ml, 100ml or 200ml size and can be purchased at drugstores or fine department stores across Canada. Prada Infusion d’Iris Eau de Toilette would make the perfect gift for any woman, because its classic scent is sure to be loved by almost everyone! I have completely fallen in love with Prada Infusion d’Iris Eau de Toilette. I adore the scent, the sophisticated bottle perks me up every morning and the compliments I receive when I wear it are almost inevitable. Besides, I’m not above a little brand lust, and knowing that I’m wearing Prada from head to toe is just so sexily satisfying! For a great scent that is fresh, feminine and perfect for any occasion, Prada Infusion d’Iris Eau de Toilette is the perfect choice. Why not check it out and see what you think?